There's no denying that actress Andrienne Wilkinson, with her inspiring good looks and refreshingly charming demeanor, is one of syndicated television’s best kept little secrets. Spend just five brief minutes in the company of this extraordinary young performer and you will almost instantaneously discover that she is so much more than the sum of her collective roles. Perhaps most recognized as the ever-elusive, exquisitely manipulative and always unpredictable Eve/Livia on the recently cancelled hit series ‘Xena Warrior Princess‘, Wilkinson has certainly stood toe to toe with some of the most seasoned performers in the industry... and trust us, it was all in a day’s work. When she first joined the cast of ‘Xena' as the scheming Eve/Livia, estranged daughter to Xena, (Lucy Lawless) during the tail end of season five, she never expected to be so embraced by both fans and critics alike, but she quickly captured an enduring place in their hearts and has remained there ever since. With intensely blue eyes and a mischievous smile... Adrienne Wilkinson is without a doubt an inimitable beauty with a ton of pure substance. Originally hailing from Memphis, Missouri, she’s certainly no stranger to Midwestern ideals. In fact, you'd be hard pressed to find a more caring, down-to-earth person. But make no mistake about it, just beyond the surface beats the heart of an intensely driven, hard-working actress with an unwavering sense of what it really takes to be true to who you are. Not only is she gorgeous and successful, but Wilkinson is the genuine article. Whether she's involved in adult/child literacy issues or putting in a 15 hour work day on the set, she consistently gives all of herself and then some, to whatever she takes on. She is one of those rare talents who can truly appreciate what she has and has no problem remembering exactly how she got it. I spoke recently with this tremendous young lady over the phone. We started off chatting about L.A., then we hit New Zealand and gradually worked our way into pop culture and that which is purely hypothetical... She was a good sport about it all and I must say, I was truly impressed. I predict that for Adrienne Wilkinson... the spotlight will get considerably brighter. UPBEAT When did you start out in the business? Adrienne Wilkinson "I was 17. I moved to Los Angeles about two days after I graduated high school— much to the horror of my family (laughs). But it takes awhile to get on your feet. I was fortunate enough that when I got here I couldn't actually audition until I was 18. Once I turned 18, things started happening for me. Honestly, I would say that when I hit 20 things changed— and it then it became my profession. I learned enough to realize exactly what it takes to survive in this business." UPBEAT So essentially here you are, this Midwestern gal who moved all the way to Los Angeles to become an actress. Adrienne Wilkinson "It's such a strange story (laughs). I'm not one of those people that had the dream since they were 10. I'd been a dancer on stage since I was three, in classes and productions. But purely as a dancer— as a hobby. It wasn't until my senior year when I only had to take a half-day of school— I randomly decided to join the theater group... and I just absolutely fell in love with it." UPBEAT That's what always amazes me about actors that start off very young because it's a lot of discipline. Adrienne Wilkinson "I will for forever be grateful that I was able to make the choice for myself because I see so many kids out here that don't know anything else. They are doing it because they know it makes their parents happy. I'm grateful that I'm not angry with the business. You hear all of the horror stories and you're like ‘Oh right’ and then when you finally get here, in one form or another you meet them all." UPBEAT You have to have a good sense of yourself in this business. Adrienne Wilkinson "You know, it's so much more important to be a better person than to be big in the industry. And I think that there's a huge fear factor— people playing the game because they think that it will get them to the top quicker. I think it's a trade off that's just not worth it." UPBEAT A number of people who have been to New Zealand have compared it to a Mecca of peaceful beauty... a spiritual retreat. Being in your early twenties, what was it like for you being in New Zealand? Adrienne Wilkinson "It was magical. When I booked the Xena I wasn't very familiar with the show. I knew about it but I wasn't up to date with the story lines. So when I first got the job the thing that I was most excited about was New Zealand. But the job turned into the gift that keeps on giving. Being in New Zealand was the strangest, most fabulous experience for me because in some ways it's very similar to the United States. It wasn't different enough to be culture shock. The thing about New Zealand that's shocking is the attitude of the people. It's the most beautifully spiritual non-self absorbed culture. They all take care of their land. They take care of their people. They have very open politics. For such a small place it's absolutely unbelievable how forward their thinking is— and you can learn so much. One weekend I had my sister and my cousin visiting and they bought all of these travel guides. In these travel guides it said, ‘If you don't have much money feel free to try hitchhiking‘. What other country endorses hitchhiking? (laughs)." UPBEAT Most extreme sports like skydiving and bungee jumping originated in that region. Did you do any of those things while you were there? Adrienne Wilkinson "Not a lot... and it wasn't from a lack of desire. I haven't gone skydiving but I've wanted to for years. I didn't get the chance to do the extreme stuff. I did however, get a chance to see the North islands. I saw geysers, volcanoes, white sand beaches, black sand beaches and amazing forests. Someone once told me that New Zealand was God's trial plan. He tried everything there and if he was happy with it he'd put it somewhere else (laughs). You can find anything there." UPBEAT It's the 15th century, how would you go about convincing everyone that the earth is actually round? Adrienne Wilkinson "(laughs)I think honestly I would have a thousand other things on my mind at that point. I'd be looking to stay healthy and find food (laughs)." UPBEAT What was your favorite Xena episode and why did it appeal to you? Adrienne Wilkinson "If I had to pick one— for me it was ‘Eve'. I loved that episode. I thought Livia got to do so many different things. The first episode I did, ‘Livia' we went over time-wise significantly so they actually had to cut it a great deal. But with ‘Eve', the director was Mark Beasley, and he adored Livia just as much as I did. We got to really play with her and make her interesting and experiment a little. I loved the opening scene in the village where she just destroyed everything. I loved the scene with Gabrielle in the tent where she (Livia) threatened to kill her. It was so brilliant— showing the mind of Livia as well as the violence. And she had such charisma. I just loved her." UPBEAT What I thought was absolutely hysterical was the episode ‘You Are There’... with our personal favorite here at UPBEAT... psycho Eve (laughs). Adrienne Wilkinson "(laughs) It was my favorite episode as Eve. You don't know how nervous I was that they were going to cut all of that out (laughs). The honest truth about that episode is when I got the script it was probably around October and I thought it was so brilliantly written. I assumed they would save it for the end. I was so excited to have a different kind of backbone to Eve again." UPBEAT If it rained music what do you think would grow? UPBEAT Tell us something about you that most people would be surprised to know about you. Adrienne Wilkinson "My sister and I participated in a dance group every summer. It was a theater program and people would come from miles around to see the shows. They hired my sister and I one summer to be a dancing Coke and popcorn for that intermission song ‘Let's All Go to the Lobby'. I was about 13 and the job lasted one weekend (laughs). We were just too mortified to continue. We couldn't handle it, even for money (laughs)." UPBEAT Share an experience that has made you reasonably sure that animals are as smart as, if not smarter, than their keepers. Adrienne Wilkinson "I've been around horses but never professionally. I never had to ride on camera before. I wasn't worried about it at all. I had no idea. Let me just say it was the most frustrating, occasionally frightening upsetting thing for me. By far I did most of my riding in the first episode that I filmed. It's so amazing just to realize how many specific personality traits each horse has. Essentially with every horse they have— there are three of them that look reasonably the same— so they can switch them around— and you can't really tell on camera. It's interesting because their personalities are so specific. The reason they used different horses was because of each animal’s individual fear. Some of them were afraid of fire— so we couldn't use those horses if there were flames in any of the scenes. There was one gorgeous horse that I got to use that absolutely understood the word action. He would stand perfectly still until he heard the word action and then he would just bolt. Finally the director started using other words like ‘apple’ and ‘Oregon' and yet the horse always knew— and part of it is when you start filming there are certain actions that take place. It was unreal how this horse knew everything. In a couple of the takes they had to get a close up of me on the horse— literally— there were four people on the ground beneath the camera holding down the horse's feet because once the word ‘action’ was yelled, he would leave. After about a day and a half of watching this horse outsmarting everyone on the set I remember thinking that without a doubt he knew exactly what was going on." UPBEAT Which Brady Bunch character do you most identify with and why? Adrienne Wilkinson "(laughs) I'd have to nix all of the girls— I just find them to be so irritating (laughs). Because she knew what was going on and was much smarter than she was ever given credit for I'll say Alice." UPBEAT What inspires you as an actress? Adrienne Wilkinson "The trust of a great director. An interesting creative idea. Having people believe in me and being challenged. Finding things that are new. On small levels— music. But everyday I'm inspired by something different and in different ways. I keep a journal that has inspirational or amusing antidotal things that people have said which can take me back to a moment— or capture the general wisdom people can say off the cuff. There are different things everyday— from books to movies to just about anything. If you're open to it I think you can be inspired by so much." UPBEAT What do you feel has been the greatest accomplishment of your career thus far? 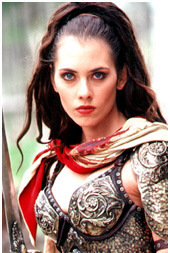 Adrienne Wilkinson "Anyone who's aware of my career knows that Xena is the biggest job that I've had. For me, in so many ways it was the greatest challenge. But honestly, it's the small things that I'm so proud of. It sounds silly but watching other friends go through so many different roads to success I have to say that I'm so proud that I've been able to keep my value system and my goals without becoming tainted. I'm much more excited to be the person I am than to be proud of the characters I play. This year has been a real learning experience for me." UPBEAT Tell us about a fascinating person (or persons) you've met in the industry. Adrienne Wilkinson "There have been so many times that I have NOT wanted to meet someone famous because I'm afraid I'll be disappointed and I'd rather have the image than be disappointed. For the most part things are almost always pretty fabulous— and they often impress you even more than you expect them to. Going back to the cast of the show Xena and the things that I found interesting, one of the people I would say was fascinating was Kevin Smith— because he almost always plays dramatic leading men and he's probably the funniest actor I've ever worked with. Greg Lee, who plays Virgil, same thing. He's become such a dear, dear person to me, he’s so different than you would expect him to be. Lucy Lawless has such a wicked sense of humor— that’s something I never expected. She has that twinkle in her eye (laughs). And I have to say that Renee O’Connor is one of the most focused and generous individuals I've ever met. Renee was the hardest working person on set. In every way shape and form she gives 100 percent of herself. She's definitely the type of person you'd want to emulate. I was hoping she'd be a nice person— but I really had no idea that I'd be so impressed and enamored by her. She's essentially been out of the country for 7 years now and I'll go to meetings here in L.A. and people will still remember the last time they saw her and their faces will just brighten up." UPBEAT Having spoken with her, I have to say, I too was blown away by her sincerity, and that doesn’t happen very often. She’s a remarkable person. I do believe she’s going to go on to do great things. Adrienne Wilkinson "Oh without a doubt. You know it." UPBEAT Describe your strangest experience at a convention. Adrienne Wilkinson "I will preface this by saying that this is my only strange experience (laughs). At first, I was really afraid to do conventions. I wasn't sure what they would be like and I was a little nervous. Now I love them— getting the feedback and seeing what people are interested in. The second convention I ever did was in London. I was still just getting my feet wet having done just one other convention. So with this one, it was a full three day weekend with all sorts of interaction. And on the third day, I had probably met every single person there face to face at least once. Someone stood up and asked me while I was on stage, ‘Can you tell us what it was like to film that scene with Lucy when you were in the woods and she was singing to you?'. And I'm racking my brain, thinking, what is she talking about? At the time, only three of my episodes had actually aired. And before I could answer, someone in the audience stands up and says ‘That wasn't her. It was the infant. It's not the same person.' I just quickly answered another question (laughs). UPBEAT If I gave you an elephant where would you hide it? Bridget Petrella is the Publisher and Editor in Chief of UPBEAT Entertainment News Online. At this point in her life, she's seriously contemplating a complete and unbridled abandonment of " typical" network television... opting instead for The Cartoon Network, Xena Warrior Princess, V.I.P., WWF Wrestling, Nick At Nite's TV Land, All HBO Original Programming and of course... TNN's Roller Jam.